There's nothing like smelling pungent, spicy, late-winter flowers in a cool and damp atmosphere. Right now, the inside of my poorly insulated house (here's to fresh air, wool sweaters and good health!) smells of the sweet box blossoms growing outside, and my front porch has a fragrance powerhouse in bloom — Edgeworthia. Plum blossoms are starting to open along the lake road I take into work each day...talk about flower-power, visual and scent-ual. Though it's officially still winter, I'm smelling "green" all around me. My first experience with the BeauFort London Come Hell or High Water collection was not a success, but by chance, Fathom V (another member of the Come Hell or High Water quintet) found me, and I'm glad it did — it's a perfect cologne for the chilled, wet and perfumed springs we enjoy in Seattle. To me, Fathom V is more fougère than deep-sea aquatic, and that's OK.
Fathom V begins with galbanum and tangy cumin (together these notes smell like fragrant grass or weeds, pulled up by the roots from damp soil). Into this mix comes an accord that reminds me of the massive, crumbling wooden barrier with its hefty pilings that separates my property from my neighbor's. This wall's wood crumbles in dry summer and smells of tar/creosote in wet weather; I swear I can also smell its thousands of big, rusty spikes and nails. If you've experienced the damp hull of a old wooden ship, Fathom V may bring that aroma to mind, too. Fathom V's "aquatic" is not, to my nose, Calone or the like, but a quirky, semi-sweet mix of lily (of the valley) and spices (pepper and perhaps some anise and mint). Greens and cumin last into Fathom V's dry down, where two latecomers sneak in (smooth vetiver and dry moss). The fact that my house is close to a lake and its watery aromas, and that I live in a city famous for its gardens and raindrops may be why Fathom V reminds me of my plants more than "sea-change" but if you're looking for a quality-smelling 'aquatic' — or a new-fashioned fougère — give it a try. BeauFort London Fathom V Eau de Parfum has good lasting power and sillage. The notes include earth, greenery, cumin, lily, black pepper, vetiver, moss, salt and aquatic accord. 50 ml is $150 at Indigo Perfumery or Twisted Lily. In the UK, it is £95 at Bloom Perfumery. 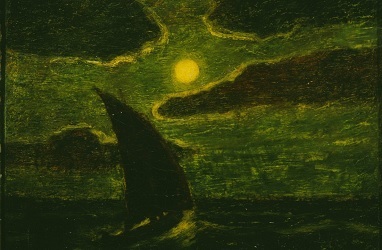 Note: top image is Sailing by Moonlight by Albert Pinkham Ryder via Wikimedia Commons. This brings to mind Hermes Epice Marine. BeauFort sounds about as far from JCE as one can get, but Fathom V and Epice Marine comprise a very small family of marine-cumin fragrances. I didn’t like Epice Marine, and you’re scaring me with tar and “thousands of big, rusty spikes and nails.” But I’m curious, too. Noz…I find this much more wearable than EM! That sounds lovely! I have the Bloom sample subscription this year so hoping it will pop up in a ‘new in’ slot. MrsD, here’s hoping a BeauFort or two will show up! This sounds interesting and different! Good review (and great picture). Thanks, Kevin! Now for me, Fathom V was far too “normal” for this house, even if it is original . I have Coeur de Noir and one day I’ll get Vi et Armis (even though it makes The Other Mr Koenigsberg feel sick). I can’t get on with the blood accord in 1805 Tonnère. Kevin, I grew up in Seattle (LONG ago) and have such envy – which lake are you near (if you don’t mind saying). Seattle is all lakes in some areas, and I miss that so much, lo these (egad) 45 years later. That “lake scent” is something I continue to sorely miss. Kevin, I love the painting!! It is as compelling as your description of this fragrance. On my way to Twisted Lily to sample. Angela, hope you enjoy it. Well as an Englishwoman (and that is a pretty mongrel term) I do love Turner but I am happy you have introduced me to the wonderful A P Ryder. That is a fabulous painting and a quick peruse of other work via wiki reveals a very touching one of a dead bird. Anyway, the perfume. It sounds interesting and of a place – I like those sorts of scents. Will look out for it – great review, thanks, Kevin. Dona…glad you like Ryder…love the bird portrait.